French red morocco, ca. 1750, lettered: Traité de S. Pierre de Luxembourg MS. in red slipcase. Owned in the 18th century by a lady (seal on flyleaf: azure a bird between two trees in a sheepfold, azure three stars of six points in pale); Baron S. de la Roche Lacarelle sale (Paris, 1894, no. 18) to Techener; H. Leclerc and Cornuau; Richard Bennett (bought Nov. 5, 1896); Catalogue of manuscripts and early printed books from the libraries of William Morris, Richard Bennett, Bertram, fourth Earl of Ashburnham, and other sources, no. 100; purchased by J. Pierpont Morgan (1837-1913) with the Bennett Collection in 1902; J.P. Morgan (1867-1943). Ms. vernacular religious tracts; written and illuminated in France, perhaps Burgundy, ca. 1490. Texts: La diète de salut (fol. 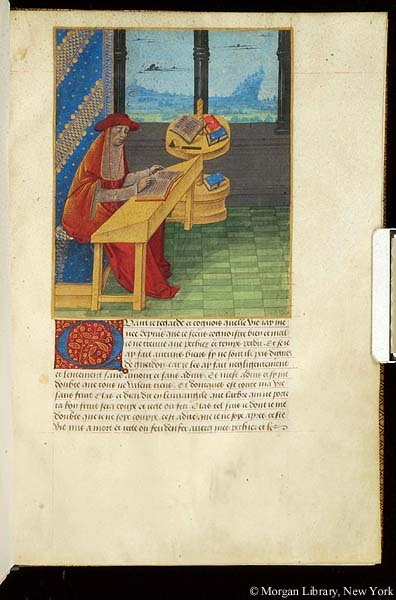 1-27v); Pierre de Nesson's Vigiles des morts à sept psaulmes et à neuf leçons (fol. 27v-56v). Decoration: 1 miniature portrait of Pierre de Luxembourg dressed as a cardinal.